Faithful God, You promised to preserve Your people and save Your inheritance, using unlikely and unexpected vessels in extending the genealogy that would bring about the birth of Your blessed Son. Give us the loyalty of Ruth and her trust in the one true God, that we, too, might honor You through our submission and respect and be counted among Your chosen people, by the grace of Jesus Christ, our Lord, and the Holy Spirit, who reign together with You, now and forever. 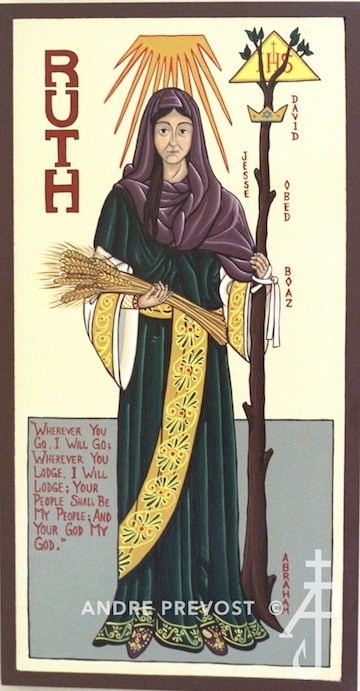 Ruth of Moab, the subject of the biblical book that bears her name, is an inspiring example of God’s grace. Although she was a Gentile, God made her the great grandmother of King David (Ruth 4:17), and an ancestress of Jesus himself (Mt 1:5). A famine in Israel led Elimelech and Naomi of Bethlehem to emigrate to the neighboring nation of Moab with their two sons. The sons married Moabite women, Orpah and Ruth, but after about ten years, Elimelech and his sons died (Ruth 1:1–5). Naomi then decided to return to Bethlehem and urged her daughters-in-law to return to their families. Orpah listened to Naomi’s but Ruth refused, replying with the stirring words: “Where you go I will go, and where you lodge I will lodge. Your people shall be my people, and your God my God” (Ruth 1:16). After Ruth arrived in Bethlehem, Boaz, a close relative of Elimelech, agreed to be Ruth’s “redeemer” (Ruth 3:7–13; 4:9–12). He took her as his wife, and Ruth gave birth to Obed, the grandfather of David (Ruth 4:13–17), thus preserving the Messianic seed. Ruth’s kindness and selfless loyalty toward Naomi, and her faith in Naomi’s God, have long endeared her to the faithful and redounded to God’s praise for his merciful choice of one so unexpected. In Boaz we have the model rich man of his age; every act and word shows his deep faith in God. In Ruth we have an example of modesty and patience, coupled with a remarkable belief in the true God. “One chief purpose of the book seems to be the tracing of the genealogy of David to the Moabitess Ruth, whose name it bears… This information gains in significance if we remember that the genealogy of David is at the same time that of Jesus Christ. The story therefore goes to show how Ruth the Moabitess, by birth an alien to Israel, was chosen to become an ancestress of the Savior. Her reception into the communion of Israel also testified to the fact that even in the days before Christ Gentiles might be admitted to the kingdom of God if only they received the promises of the covenant in true faith.